The US is concerned China is using "sheer size and muscle" to strong-arm smaller nations in the row over the South China Sea, Barack Obama says. The US president's comments came amid heightened focus on Beijing's construction of artificial islands in disputed areas of the sea. 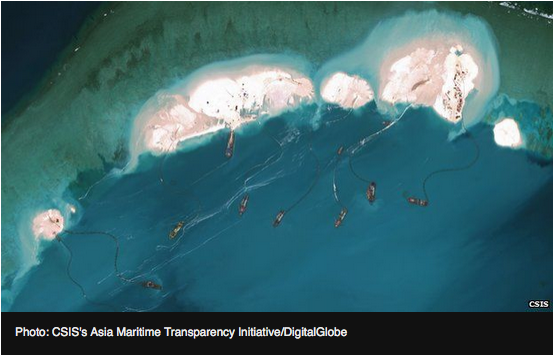 On Thursday a US think-tank released images showing land reclamation work on a reef claimed by the Philippines. China says the work is needed to safeguard its sovereignty. They say China is illegally reclaiming land in contested areas to create artificial islands with facilities that could potentially be for military use. 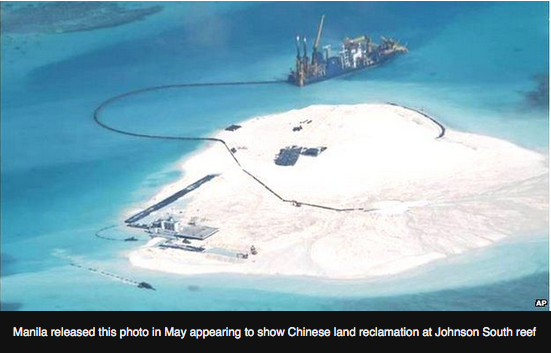 Images have emerged of work in multiple areas in the Spratly islands, which several nations claim. 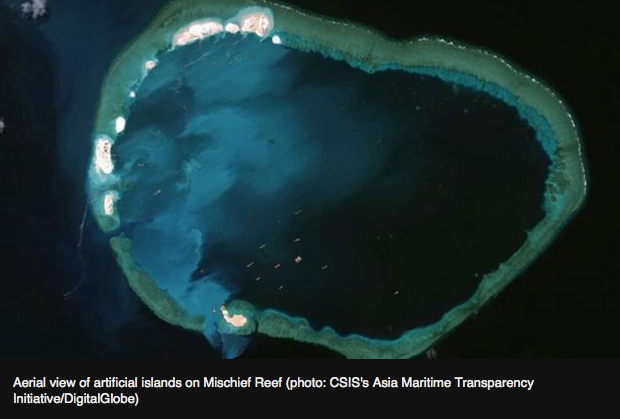 The most recent images, from the Centre for Strategic and International Studies, showed work on Mischief reef. 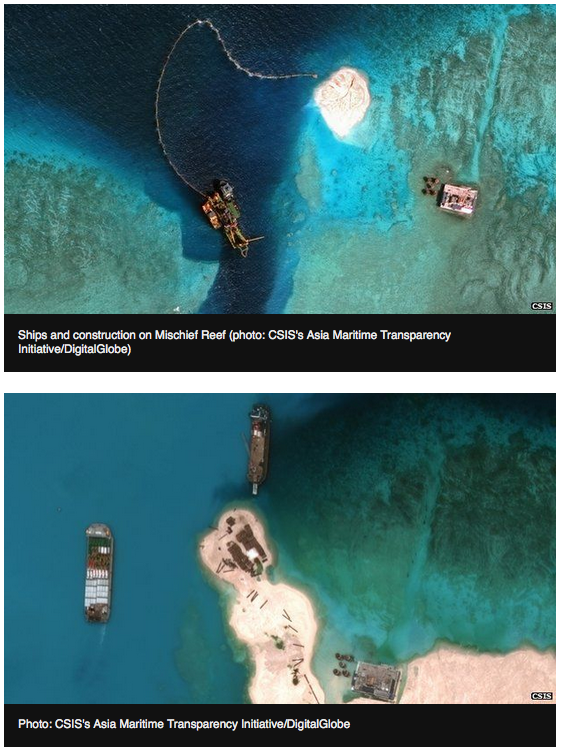 The thinktank published before-and-after satellite pictures* showing man-made islands with runways and harbours, and Chinese vessels dredging sand on to the reef. Asked about the issue during a visit to Jamaica, Mr Obama said the views of smaller claimant nations had to be considered. "Where we get concerned with China is where it is not necessarily abiding by international norms and rules, and is using its sheer size and muscle to force countries into subordinate positions," he said. Hours earlier, China gave one of its most detailed comments on the issue at a foreign ministry daily press briefing. Spokeswoman Hua Chunying said (transcript in Chinese)* that China had "indisputable rights" to the Spratly islands, and that it was only "protecting the country's national sovereignty and maritime rights". The construction was to serve troops protecting the area and civilian activity such as search and rescue operations, scientific research and commercial fishing, she said. As we get closer, to my right, I am sure I can now see something pale and sandy beside the platform. "That looks like land!" I say. It can't be. I look at my GPS. There is no land marked anywhere near here, only a submerged reef of the Spratly Island chain. But my eyes are not deceiving me. A few kilometres away I can now clearly see the outline of an island. In recent days, several senior US officials have weighed in on China's land reclamation work, warning it raises regional tensions. He said that work to date had created more than 4 sq km (1.5 sq miles) of artificial land mass. 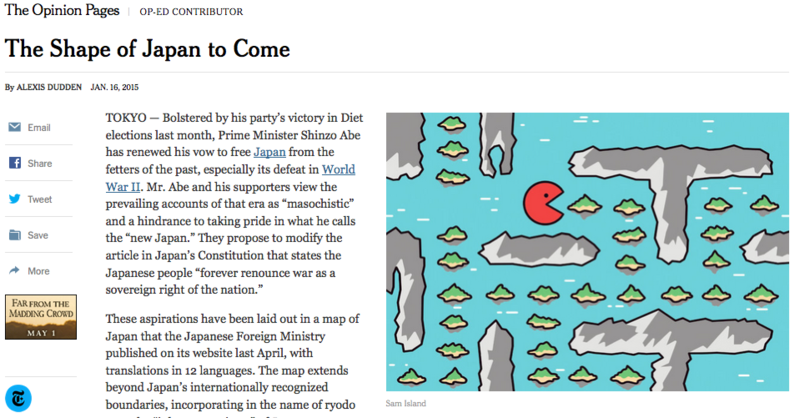 US Navy Lt Cmdr Wilson VornDick wrote in an analysis* on the CSIS website: "It appears that China's building projects are part of an expansive territorial grab or to make China's disputed Nine-Dash Line claim a reality." 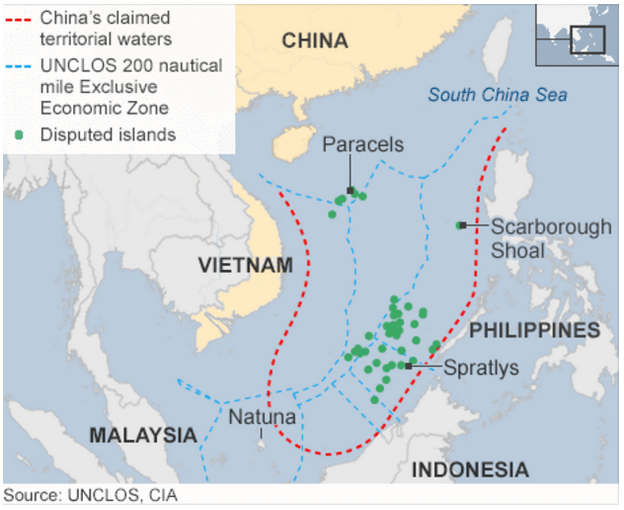 The Nine-Dash line is a boundary which China uses to demarcate its claims in the South China Sea. It is not recognised outside China. The row has already led to conflict. When China placed an oil rig in waters claimed by Vietnam last year, anti-China riots erupted. I'd really like to know how ALEXIS DUDDEN says about the problems China caused.